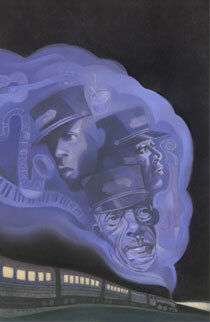 Gary Kelley created this poster for The Arena Stage theater company's production of Pullman Porter Blues. Playwright Cheryl L. West was inspired by the Pullman Porters she saw on the trains and wrote a play centered around the men of the Sykes family, 3 generations of porters. Art director Nicky Lindeman couldn't have picked a better artist. Kelley has done innumerable blues related artworks including "Black Cat Bone". Want to see the play? Order tickets here.